This easygoing home offers the perfect blend of casual space and formal areas. An open, two story foyer introduces the common areas on the first floor, including a vaulted great room with fireplace, a bayed dining area, and a U-shaped kitchen with breakfast bay. 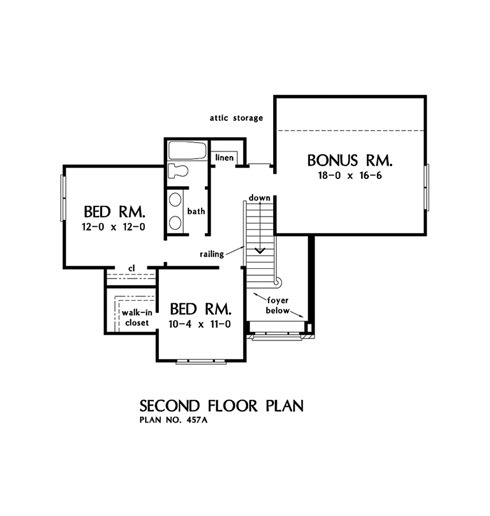 Bonus room access is at the top of the stairs, while two bedrooms share a full bath on the second level. A luxurious master bedroom and bath are located privately downstairs. 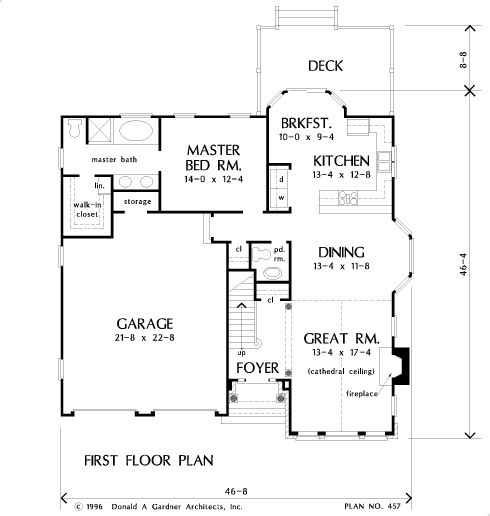 1st Floor: 1262 Sq. 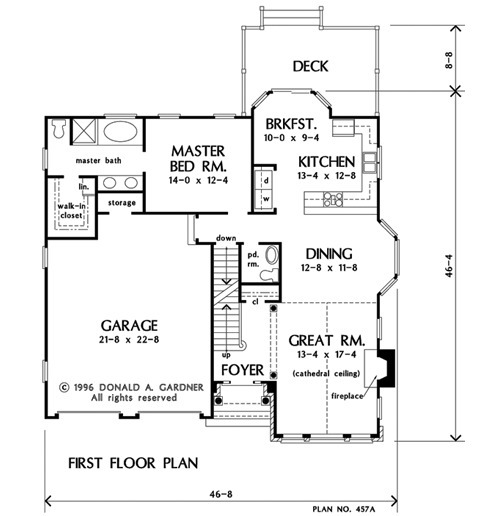 Ft.
House Dimensions: 46' 8" x 46' 4"
Great Room: 13' 4" x 17' 6"
Master Bedroom: 14' 0" x 12' 4"
Foyer (2 Story): 8' 0" x 10' 4" x 17' 0"
Dining Room : 13' 4" x 11' 8" x 8' 0"
Great Room (Cathedral): 13' 4" x 17' 6" x 14' 4"
Kitchen : 13' 4" x 12' 8" x 8' 0"
Breakfast Room : 10' 0" x 9' 4" x 8' 0"
Utility Room : 2' 8" x 6' 0" x 8' 0"
Bonus Room (Clipped): 18' 0" x 16' 6" x 8' 0"
Garage Storage : 12' 0" x 3' 4" x 0' 0"
Master Bedroom : 14' 0" x 12' 4" x 8' 0"
Porch - Front : 7' 6" x 3' 8" x 0' 0"
Deck / Patio : 18' 4" x 12' 0" x 0' 0"
Storage (Other) : 6' 0" x 2' 6" x 0' 0"